Colleen Quint — Illustration Process: Counterattack! 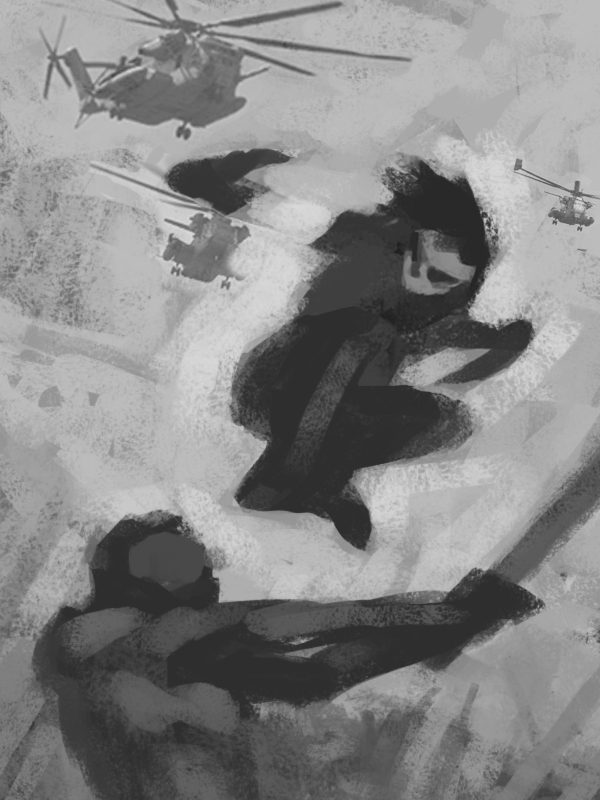 For starters, a rough, loose thumbnail I scribbled in Photoshop. Then I did a boatload of research. Here is a sample of images collected from diving into the interwebs. In total I actually have 60+ images of research material covering things of interest such as: parkour, cyborg, futuristic armor, helicopters, dust kicked up by helicopters, knives, swords, and model poses. Since I didn’t have a live male model to reference, I referenced myself! It makes sense when sketching the final poses because I can feel which muscles are straining and which aren’t. This exercise, combined with basic male anatomy knowledge, helps convey the figures in a convincing manner. Next up are the value and color studies, all done in Photoshop. I approached this painting differently than the others to date. Instead of painting directly onto the charcoal transfer, I enhanced the lines by painting over them with a mixture of burnt umber and ultramarine blue. Working on top of that, I can lose or keep whatever lines I want without losing important information. 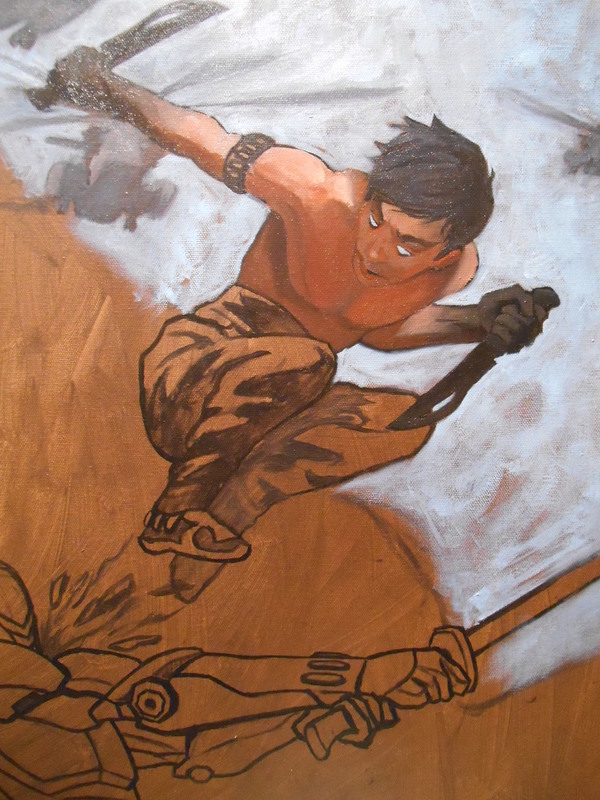 After doing research on past illustrators, I found Dean Cornwell’s work and wanted to try and emulate his look. I also discovered a video showing his process here. Apparently, he also used ink or paint to inform his underdrawing. Of course, he did a much better job of it. Here are additional process shots taken during breaks. Really enjoyed the results and am looking forward to trying the same approach on future paintings. The whole idea of painting lines didn’t sit well with me for awhile because it felt like an elaborate paint-by-number deal. After trying it on this piece, however, I don’t know what I was thinking. The figures pop forward more and I had much smoother time painting this 18×24 inch canvas from start to finish (6 hours). Thanks for tuning in on my journey, I hope it’s helpful.